Romania's prime minister has survived a vote of no confidence, a week after he went on trial on corruption charges. Parliament voted 207 to eight for the no-confidence motion, short of the 275 votes needed to dismiss Victor Ponta from office. MPs from Mr Ponta's Social Democratic Party and another party did not vote. Mr Ponta, who prosecutors say will not be arrested, has repeatedly denied the allegations against him since he was charged in July. 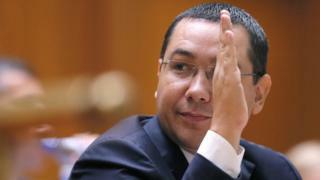 Mr Ponta will be the first prime minister in Romania to stand trial while in office. He faces charges of fraud, tax evasion and money laundering dating back to his days as a lawyer before he was elected prime minister in 2012. As Tuesday's parliamentary session got under way, several thousand people demonstrated in a nearby park, chanting that the government was a "disgrace for Romania in the EU". President Klaus Iohannis, who has previously called on Mr Ponta to resign, said Romania's image would suffer because of the case. Four other people have also been indicted in the case. But the opposition has also been hit by corruption allegations. On Monday, two MPs from the Liberal Party were indicted on bribery charges. Hundreds of top officials have been convicted of fraud in recent years, as the country's anti-corruption agency continues its drive to rid Romania of corruption. Many of those targeted claim that the cases against them are politically motivated.